What are Ketostix urine reagent test strips? Ketostix urine reagent test strips are designed to measure the presence and concentration of acetoacetic acid in the urine. Acetoacetic acid is a naturally occurring keto acid, which is also known as diacetic acid. This acid is produced by the liver and kidneys and can be used as an energy source by the heart and brain. However, people suffering from diabetes may not have a strong metabolism, which can result in abundance of ketone bodies. It is importance to keep a check on the level of acetoacetic acid as it can cause medical issues and complications. How do urinalysis reagent strips work? These thin plastic strips are fairly easy to use. Each strip has a small reagent area on it. Once it is dipped into a urine sample, the color of the strip will change to indicate the amount of ketones present in the urine. Ketostix can be used by patients suffering from type 1 or type 2 diabetes. Diabetic patients must know what ketones are and why they should be regularly checked. In simple words, ketones are a warning sign that the body is using fat for energy. If ketones are present in the urine, it means that the person does not have enough insulin in his or her body, and the glucose levels are high. There are no major risks involved in using urine analysis strips. You may get inaccurate results if you do not use the strips correctly. You can ask your doctor for help and find out when and how often to use ketostix. The ketostix package comes with an instruction leaflet that you can refer to for help. 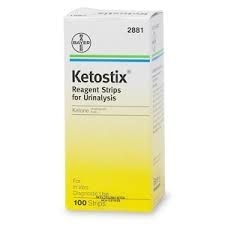 You can now buy ketostix reagent strips for urinalysis test online at HealthWarehouse.com. and have them delivered to your home. The strips provide a fast, convenient way of testing urine for the presence and concentration of acetoacetic acid (ketone). This substance when found in the urine provides information on carbohydrate and fat metabolism. Acetoacetic acid can be found in the urine from diabetics and is more commonly referred to as a "ketone body." Use of Ketostix Reagent Strips can alert you and your doctor or diabetes educator to changes in your condition for which adjustments in your diet and/or medication may be needed. Carefully follow the testing schedule your doctor or educator establishes. - Collect fresh urine specimen in a clean, dry container. - Dip test area of strip in urine and remove immediately. (Alternatively, wet the test area by passing strip through urine stream). - Compare test area to Colour Chart exactly 10 seconds after wetting. Ignore colour changes that occur after 10 seconds. - Store at temperatures between 59° - 86°F (15° - 30°C) and out of direct sunlight. - Replace cap immediately and tightly. Do not remove desiccant from bottle. - Read enclosed directions carefully. Use within 6 months after first opening. Do not use after unopened expiration date. - Use only if tamper evident seals on this carton are intact. If you have any questions or comments about this product please call 1-800-348-8100 or visit www.bayerdiabetes.com.